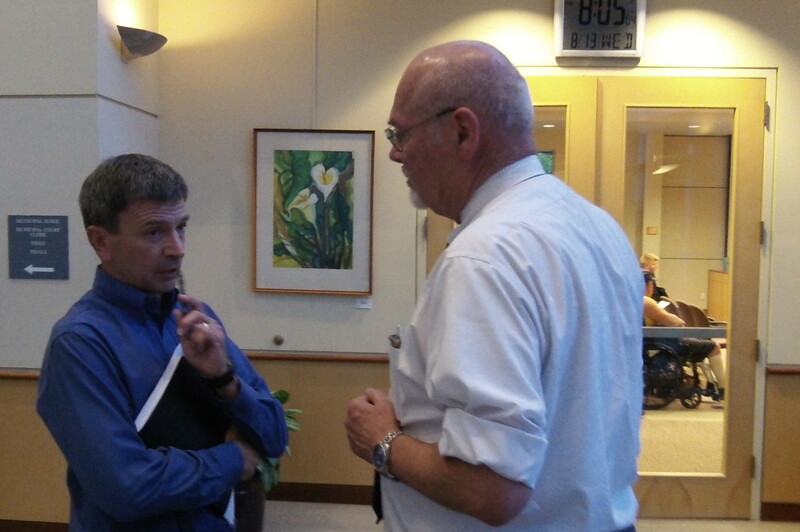 Outside the council meeting, City Attorney Jim Delapoer, right, confers with Mark Stoner of Lowe’s. The city of Albany will seek a compromise with Lowe’s that tries to make sure the company goes ahead with plans to build a home improvement center at Oak Street and Ninth Avenue, as it promised in 2011. Mark Stoner, the California-based western regional real estate manager for Lowe’s, acknowledged to the city council Wednesday that the city had done everything it promised in a 2011 agreement. But he said the company’s plans had changed based on the economy and sales. While Lowe’s had been exanding at the rate of 120-150 new stores a year when the Albany plans were made, it then stopped building altogether but now is resuming construction at the rate of about 12 a year. The company wants to go ahead with the Albany project but make the building smaller and more efficient: 105,000 square feet, including 85,000 feet of retail space, plus 15,000 square feet in a garden center, instead of the overall total of 150,000 feet origially approved. Stoner said construction would start in May and the store would open in November or December 2015. The size of the staff would depend not on the building size but on the amount of business. Stoner said a big San Francisco Lowe’s has 350 workers while a smaller one elsewhere has 104; Albany’s would likely be toward the lower number. As reported earlier, Lowe’s is asking that Albany extend the deadline for opening the store one year to Dec. 31, 2015, allow the smaller size, and forgo the $1,000 per day “liquidated damages” — City Attorney Jim Delapoer says “penalty” is the wrong term — which Lowe’s contract with the city calls for if the store is not opened this year. Albany spent around $5 million to improve streets and utilities and took other steps to accommodate Lowe’s. Council members said they still want Lowe’s to build, but they also want something for the delay and change in plans. They authorized Delapoer to try for a compromise. The lawyer asked what the council would think if Lowe’s offered to pay the city one year’s property taxes that will otherwise be lost because of the delay. Outside the meeting, he apparently had suggested to Stoner that Lowe’s make such an offer, and the council seemed to like it. This apparently would mean the company would be spared the liquidated damages if the store opens before the new deadline. Given the poor economy and the city’s past performance, how much leverage does the Council really have in this negotiation? Probably not much. I got the impression from last night’s meeting that Albany wants Lowe’s more than Lowe’s wants Albany. Both parties put on their nice, public faces and said the right things. Now the messy work of negotiation begins behind closed doors. And therein lies the challenge. On many issues the city has shown an unwillingness to listen, an itchy finger towards litigation, and a track record of snatching defeat from the jaws of victory. If these tendencies surface during the negotiation, kiss this deal good-bye. Lowe’s has no incentive to put up with such nonsense. But let’s see how the negotiation goes. I still have a glimmer of hope. To Gordon that somehow translates to an “unwillingness to listen” and “snatching defeat from victory.” This shows a total lack of connection to reality. Hating city government in general, and vilifying city officials with innuendo and deception, does not work towards building a better economic future for the community. The property will eventually be developed in some manner and higher propert taxes collected at that time. Meanwhile, I assume the city/county etal is still collecting property taxes on the land. With the improvements to Oak St. and the apartments that are going in just to the South, I would assume the land has increased in valuation. I would like to see the “CITY” show some SPINE and enforce the contract! What happens a year from now when LOWES still hasn’t built anything? Why should the citizens of Albany show any respect for local ordinances & codes when they selectively enforces “legal documents” at their discretion? Sounds like it’s time for RECALL! Seems like a good alternative might be that Lowe’s could locate now at the closed K-Mart store. Parking is much better that 9th St. No need for a totally new store costs. Jobs get posted quickly. Perhaps Hasso could get Mr. Delapoer to put that in the mix. Just some statistical evidence for clarity. K-Mart sq. footage under roof = 84,000 Current garden area outside = 5,000 sq. ft. Room to expand garden / lumber and bldg supplies = plenty. Remodeling is cost effective and the location is excellent. I think this is a good idea to at least look at this possibility. If I were the city, I would try to secure the three or four acres that Lowe’s now does not need because of the downsizing and move the projected location for the new police station to this site. The long term savings in labor costs and improved service to the citizens of Albany by having a more centrally located police station far outweigh the short term financial setback.